Singapore Airlines long-haul low-cost subsidiary Scoot has begun the long anticipated transition from 777s to more efficient 787s. Scoot took delivery of its first of 20 787s on 31-Jan-2015 and plans to place the aircraft into service on 5-Feb-2014. Scoot is planning a rapid fleet transition which will see all six of its 777-200s phased out by the end of 3Q2015. The airline also plans to launch several new routes as its fleet expands to 10 aircraft, a mix of 375-seat 787-9s and 335-seat 787-8s, by Apr-2016. The 787 is important, but not the only, component of a long-term business plan that Scoot needs to implement to reach profitability. Partnerships are also crucial for unlocking growth as currently less than 5% of Scoot passengers connect to other airlines. Scoot launched services in Jun-2012 with an initial fleet of two 777-200s in two-class 402-seat configuration and added three more 402-seat 777-200s by its first anniversary in Jun-2013. In late 2013 the carrier added a sixth 777-200 but in original SIA 323-seat two-class configuration after opting against retrofitting the aircraft. The 31-Jan-2015 handover in Seattle of the first 787-9 marks Scoot’s first aircraft delivery in 15 months, an unusually long time for a new LCC. The first 787, which was originally slated to be delivered in Nov-2014, is scheduled to arrive in Singapore on 2-Feb-2015 and be placed into revenue service on 5-Feb-2015 on the Singapore-Perth route. Scoot announced in Dec-2014 plans to upgrade Perth to daily from 1-Feb-2015. But Scoot has delayed the introduction of daily services to Perth and will serve Perth over the next two months with five and occasionally six weekly frequencies depending on the week. Scoot’s second 787-9 is slated to be delivered in Feb-2015 and be placed into service on Singapore-Sydney in Mar-2015. The third 787-9 will also be allocated to the Australian market and is slated to operate Singapore-Gold Coast from Apr-2015. Bangkok will also transition to the 787-9 in Apr-2015 as Bangkok is currently served with the same two aircraft as Sydney and Gold Coast. Sydney, Bangkok and Gold Coast were Scoot’s first three destinations. Since mid-2013 Scoot has generally kept the same Singapore-Gold Coast-Singapore-Bangkok-Singapore-Sydney-Singapore rotation for two of its 402-seat 777-200s. The exception is over the last year Scoot has opted to route some off peak flights on a Singapore-Sydney-Gold Coast-Singapore triangle routing in response to challenging conditions in the Australian market. Scoot currently operates a Singapore-Sydney-Gold Coast-Singapore routing on two middle of the week frequencies while operating four non-stop Singapore-Sydney-Singapore rotations and three non-stop Singapore-Gold Coast-Singapore rotations. Initially this schedule will be maintained as the 787-9s are introduced. The Singapore-Sydney-Singapore and Singapore-Sydney-Gold Coast-Singapore flights will be the first to see the 787 followed by Singapore-Gold Coast-Singapore. Scoot plans to resume in Apr-2015 its original schedule of daily non-stops to/from Sydney and five weekly non-stops to/from Gold Coast. Scoot also plans to finally introduce daily flights to Perth by the end of Apr-2015. As a result Scoot's Australia schedule will feature 19 weekly flights and 14,250 weekly return seats by the end of Apr-2015, a 27% increase compared to the 11,256 seats it currently provides. Tianjin, Scoot’s first destination in mainland China, was added in Aug-2012. Taipei and Tokyo Narita quickly followed in Sep-2012, marking the completion of the initial phase in developing the network. Three more Chinese destinations – Nanjing, Qingdao and Shenyang – were added in 2013 along with Seoul, Hong Kong and Perth. Scoot currently operates a total of 47 weekly flights from Singapore, providing 18,341 weekly one-way seats from Singapore (based on its schedule for the week commencing 25-Jan-2015 and ending 1-Feb-2015). Seat capacity from Singapore will be increased by about 10% to 20,151 one-way weekly seats by the end of Feb-2015, at which point the 323-seat 777-200 will be phased out and Hong Kong is returned to daily. The schedule for late Feb-2015 also features a sixth (but not seventh) flight to Perth and a seasonal fifth frequency to Nanjing. The approximately 20,000 weekly one-way seats will give Scoot about a 3% share of total seat capacity in Singapore or about a 9% share of LCC capacity. About 4,000 of Scoot's seats from Singapore are operated to Taipei, where Scoot operates 10 weekly flights with seven continuing onto Tokyo Narita and three to Seoul. Scoot has pick-up rights on the Taipei-Narita and Taipei-Seoul sectors but does not pick up local passengers on its two weekly Qingdao-Shenyang flights (or its two weekly seasonal flights from Sydney to Gold Coast). Scoot plans to phase out its 323-seat 777-200 by the end of Feb-2014 and its five 402-seat 777-200s between Mar-2015 and Aug-2015. The last 777-200 will be phased out after the seventh 787 is delivered. This 787 will be Scoot’s first 787-8. The sixth 787-9 is being allocated as a growth aircraft and will be used to launch one or two new routes in late Jun-2015 or Jul-2015. Scoot is expected to announce its next batch of new routes within the next one to two months. Scoot has been evaluating several potential new routes but final decisions hinge partially on its ability to secure the slots it seeks. The preference is to focus most expansion in 2015 on mainland China, where Scoot has been seeking slots and has been in discussions with several additional Chinese airports. If it is able to move ahead with expansion in China two destinations will likely be launched at about the same time around the middle of the year with each being served with approximately three weekly flights. Scoot plans primarily to use 787-8s to China as its China routes are better suited for smaller aircraft. Using smaller aircraft should also enable Scoot to gradually build up frequencies to its existing China destinations. Tianjin, Qingdao and Shenyang have generally been served over the last 15 months with the 323-seat 777 (including the current week commencing 25-Jan-2015) although this aircraft has also been occasionally used to Australia during peak periods in China. Scoot is configuring its 787-8s with 314 economy and 21 business class seats while its 787-9s are being configured with 340 economy and 35 business class seats. The smaller premium cabin is also ideal for China routes as Scoot sees higher demand for its ScootBiz product, which is more like a premium economy product with recliner style seats, on its Australia routes. Scoot’s 402-seat 777-200s currently consist of 370 economy and 32 business class seats while its 323-seat 777-200 consists of 293 economy and 30 business class seats. Scoot owns all five of its 402-seat 777-200s and is now trying to sell these aircraft. The 323-seat 777-200 has been leased from SIA since late 2013. This aircraft will be reconfigured over the next couple of months and leased to new Thailand-based sister carrier NokScoot. Currently NokScoot has one 415-seat 777-200 (391 economy and 24 business seats) which has been sourced separately from SIA and is being used on charters ahead of its expected late 1Q2015 launch of scheduled services. The 323-seat aircraft that is now at Scoot will become NokScoot’s second aircraft following retrofit. NokScoot is also looking at a potential third 777-200 by the end of 2015 but it cannot take over any of Scoot’s 402-seat 777-200s due to a restriction in Thailand barring the import of aircraft that are older than 14 years old. Of Scoot’s five owned 777-200s, four are 17 years old while one is 15 years old, according to the CAPA Fleet Database. Challenges in finding new homes is a potential concern because delays in remarketing the aircraft could impact Scoot’s ability to improve its financial position as it transitions to more efficient 787s. The age of the aircraft and their configuration limits the pool of potential buyers. A reconfiguration with such old aircraft would not be cost effective, meaning Scoot will likely need to find a leisure carrier or LCC interested in the current configuration. Scoot will also own its initial fleet of 787s – at least for the time being. But Scoot is looking at potential sale and leaseback transactions. Leasing would be a sensible option for Scoot. While SIA generally does not lease aircraft – unless they are temporary bridge aircraft such as its A330 fleet – LCCs typically pursue leases as part of their overall lean approach to capital commitments. Scoot now plans to take its twentieth and final 787 in the fiscal year ending Mar-2019. The initial delivery dates were decided by SIA, which was keen on a quicker delivery schedule because it was intending to use most of the aircraft as replacements. Scoot was unable to change the delivery dates of the first 10 aircraft, all of which are now slated to be delivered by 31-Mar-2016, which marks the end of the SIA Group’s 2016 fiscal year. The tenth aircraft will likely not be placed into service until Apr-2016, or the start of FY2017. In addition to the one or two new destinations for mid-2015 Scoot is looking at adding two to three destinations in 4Q2015. This includes Melbourne, which will be launched on 1-Nov-2015 with five weekly flights. Scoot already announced and began ticket sales for Melbourne in Dec-2014. The other one or two new destinations could again be in China, which are more easily launched with less lead time than Australia. Booking patterns for the Chinese market is different. Scoot’s strategy for China is also to launch routes that are not already served while in Australia Scoot faces intense competition and therefore can benefit from the longer sales lead time. About another three new destinations are expected in early 2016. As a result Scoot’s network will likely grow from 12 destinations (excluding Singapore) to approximately 20 destinations in a span of only 9 to 10 months. China is expected to account for most of the growth as Scoot envisions its Chinese network doubling in size from four to eight destinations. The expansion is ambitious but not unrealistic given the improved efficiencies that come with the 787 and the bigger scale it will achieve as the fleet and network grows. Scoot also has a bit of catch-up to do after not growing its network or fleet size for over 18 months (from Nov-2013 to mid-2015). Scoot also cut total seat capacity in 2014 as off-peak flights to Australia were reduced in response to challenging market conditions. Scoot also reduced flights on the Qingdao-Shenyang from four to two weekly flights but maintained four weekly flights on Singapore-Qingdao. Most importantly Scoot now has the partnerships in place to support the rapid growth. Currently less than 5% of Scoot passengers transfer to other carriers. Most of its transfer traffic is with Tigerair, which Scoot has been working with for over two years. Transfer volumes with Tigerair have doubled in size since the two carriers’ application for anti-trust immunity was approved by Singapore competition authorities in Aug-2014. But the base was very tiny and Scoot still has a long way to go before achieving the over 50% transit traffic portion at Asia’s largest long-haul LCC, AirAsia X.
Scoot and Tigerair expect to see further increases in transit traffic as they implement seamless booking across their websites, which will be made possible by Tigerair upgrading its reservation system to the same version of Navitaire New Skies that is used by Scoot. There should also be an uptick in transfer traffic after Tigerair starts to retime some of its flights to improve connections. Scoot is not planning any schedule changes as it has limited flexibility with the way it rotates its small fleet of aircraft. The two carriers also recently implemented a joint venture on Singapore-Bangkok and Singapore-Hong Kong and are in discussions about a JV on their third overlapping route, Singapore-Taipei. Perth was another overlapping route but a JV is no longer needed as Tigerair is pulling out of Perth on 7-Feb-2014. The decision by Scoot to upgrade Perth to daily coincided with Tigerair deciding to withdraw from the market. Tigerair currently serves Peth with one daily A320 flight. Scoot is also looking to further build its portfolio of partners. Virgin Australia was added as its fifth interline partner in late 2014, joining Tigerair, Singapore Airlines, SilkAir and Nok Air. The Virgin Australia tie-up, which gives Scoot access to eight offline destinations in Australia, was announced in Jan-2015 but had a soft launch in Dec-2014. Scoot expects 1% to 2% of its total passengers to connect onto Virgin Australia domestic flights once Melbourne is added as its fourth Australian gateway in Nov-2015. This equates to 4% to 8% of Scoot's Australia passengers as Australia accounts for approximately one-quarter of Scoot’s total seat capacity. Virgin Australia grows Scoot’s offline network to a total of 65 destinations. Scoot currently interlines with Tigerair to 31 offline destinations as well as the three overlapping destinations. Scoot interlines with SIA and or SilkAir to 18 destinations, nine of which are also covered by the Tigerair interline. Nok provides connections from Bangkok to 21 destinations throughout Thailand, four of which are also covered from Singapore by the Tigerair interline. Scoot plans to start interlining with NokScoot after NokScoot launches operations and is in talks with one other potential partner. NokScoot will open up potential new destinations in North Asia as well as provide additional options for overlapping destinations such as Tokyo Narita. Scoot now serves Tokyo via Taipei and will be able to offer a second option with NokScoot via Bangkok. Tigerair is currently Scoot’s only two-way partnership. None of its other partners currently sell on Scoot. But Scoot is aiming to expand its partnership with Virgin Australia to include Virgin Australia selling on Scoot. NokScoot and Nok would also likely start selling on Scoot at some point. SIA and SilkAir have no intentions of selling on Scoot as part of the SIA Group strategy to keep the brands separate. But Scoot and Tigerair are being incorporated into the SIA/SilkAir frequent flier programme. 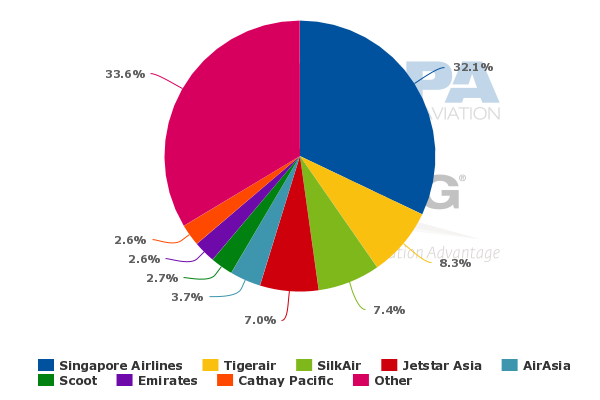 Tigerair became a SIA subsidiary in late 2014 as SIA increased its stake from 40% to about 56% while Scoot has been 100% owed by SIA since its establishment. The closer ties with Tigerair and its new partnerships are essential for Scoot to succeed at growing passenger numbers and boosting yield. The Singapore market is too limited to support a 20-aircraft fleet. Ultimately transit numbers similar to the levels of AirAsia X will be needed. The 787 will significantly reduce unit costs, bringing Scoot closer to profitability. But a new aircraft type alone hardly guarantees profitability. Scoot will not face the same set of challenges as AirAsia X, which incurred large losses in 2014 as rapid and strategic expansion came as market conditions in Malaysia deteriorated. As a subsidiary of a full-service airline the Scoot strategy is different and market conditions which Scoot will face as it grows will not be the same. But Scoot will have its own set of challenges, some of which cannot be predicted. What is certain is Scoot will face a critical test over the next couple of years as it expands rapidly and starts to fully implement its long-term strategy. CAPA has analysed Scoot extensively since its establishment in 2011 and launch in 2012. Here is the full list of reports on Scoot in chronological order.